Upholding human rights in a state of emergency: What Nigeria must do now! Since 2009, most parts of northern Nigeria, particularly the north-east zone, have been enveloped in a climate of fear and insecurity. This is largely due to the activities of the group Jamā’atu Ahlis Sunnah Lādda’awatih wal-Jihad (People Committed to the Propagation of the Prophet’s Teachings and Jihad), popularly known as “Boko Haram”. What began as a religious movement in 2002 has since grown into a full blown insurgence. The extra-judicial killing of its founder, Yusuf Mohammed, by the police in 2009, perhaps, served as a critical factor. The perennial failure of governance, porous borders with volatile neighbouring countries, high levels of illiteracy, poverty and unemployment, and more recently, the hard-handedness of the government’s military response, have also made mobilisation of support and radicalization a lot easier for the group. The protracted security crisis has now led to a human rights and humanitarian crisis in those parts. Government interventions, for a long time, proved inadequate and failed to contain the crisis. Instead, several human rights violations were reported from the activities of both the government’s military Joint Task Force and Boko Haram. According to Amnesty International, people living in that part of the country are precariously trapped in a vicious cycle of violence. Lives and limbs have been lost, properties destroyed and people displaced. There is no consensus about the exact casualty figures. Nonetheless, there is no argument that it is well in the thousands now. 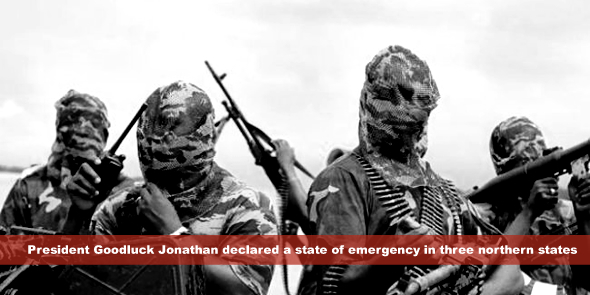 On 14 May 2013, President Goodluck Jonathan declared a state of emergency in three northern states. Section 305 of the 1999 Nigerian Constitution empowers him to do this. Since then, there has been even more allegations, and denials, of persisting human rights violations. For instance, on 31 May 2013 international news channel Aljazeera carried a report titled “Civilians among dead in Nigeria offensive”. The next day, the government responded and denounced this report as “contrived and misleading”. The Nigerian Constitution lays out a clear procedure for enforcing a state of emergency in any part of the federation. It also makes provision for the guarantee of human rights at all times, including in cases of emergency. The National Assembly and, more importantly, the National Human Rights Commission have significant roles to play here to ensure compliance with the law and protection of human rights. But with the current state of affairs in Northern Nigeria, the question remains whether there is sufficient space for human rights in the state of emergency. Section 17 (1) of the Nigerian Constitution upholds “freedom, equality and justice” as the ideals upon which social order is founded. In furtherance of this social order, sub-Section 2 (b) stipulates that “the sanctity of the human person shall be recognized and human dignity shall be maintained and enhanced”. More so, Sections 33 to 42 spell out guarantees of the fundamental rights to life; dignity of the human person; personal liberty; fair hearing; private and family life; freedom of thought, conscience and religion; freedom of expression and the press; peaceful assembly and association; freedom of movement; and freedom from discrimination. Generally, human rights are not absolute, especially in a state of emergency. International human rights law recognizes this, and so does the Nigerian Constitution. Limitations or derogations must, however, apply within law and reason. Section 45 of the Constitution provides that derogations from the rights to life and personal liberty may be permitted during a state of emergency but only when the measures taken are reasonably justifiable for addressing existing situations within those periods. The rights to dignity of the human person and fair hearing, particularly the prohibition of torture and the non retroactive application of penal laws, are however sacrosanct and no derogation is allowed, even in a state of emergency. For terror suspects and those related to them, these guarantees are priceless. Nonetheless, in 2012 Amnesty International released a report, “Nigeria: Trapped in the Cycle of Violence” and chronicled cases of extrajudicial killings, forced evictions, incommunicado, arbitrary and unlawful detention and enforced disappearances in Northern Nigeria. As Nigeria grapples with security challenges and the attendant human rights and humanitarian crisis in Northern Nigeria, it will be regrettable if it loses sight of its founding ideals or operates outside its constitutional and legal framework. The National Human Rights Commission and civil society must continue to prevail on the government and security actors to ensure that, even in the state of emergency, the rules of engagement of the military respect and protect human rights. Independent investigations should be carried out where violations have been reported and accountability demanded where violations are established to have occurred. The founding ideals of its social order can also provide guidance on what Nigeria can do now in developing appropriate responses to its security and human rights crisis. First, it must recognise that any society that sacrifices human rights and fundamental freedoms on the altar of security loses both. Most security experts agree that terrorism is a symptom that something is not right within the society. In Nigeria’s case, terrorism indicates a disconnection between the people and the state. Efforts to address the prevailing crisis must reckon with this and seek to bridge the divide between the state and its citizenry. The Nigeria project must be an inclusive enterprise. Until fundamental freedoms are upheld for all, peace will remain elusive and its democracy will remain threatened. Second, the current crisis presents an opportunity to interrogate and begin to address the gapping inequalities in Nigeria. The nation’s vast resources must be deployed for the welfare of all and not just the select few in government. By promoting equality, the government will be addressing a root cause of insecurity, whether in the Niger Delta or in Northern Nigeria. Even the Nigeria Constitution recognises and forges a holy matrimony between the security and the welfare of the people. Section 14 (2) (b) makes the preservation of this matrimony the primary responsibility of government. Lastly, the need for Nigeria’s democracy to be supported with strong institutions for justice and accountability is imperative. There must be an end to impunity. The time for meaningful justice and security sector reform is now! In the absence of effective and efficient mechanisms for channelling, resolving and diffusing tensions and grievances in the society, violent conflict will remain inevitable. In sum, to end its security crisis, Nigeria must begin to actively invest in curbing impunity, promoting equality and upholding the fundamental freedoms of its people. And it must begin now! Chinedu Nwagu is Program Manager, CLEEN Foundation, Abuja, Nigeria. He holds an LLB from Imo State University, a BL from the Nigeria Law School, Nigeria and an LLM in Human Rights and Democratization in Africa from the Centre for Human Rights, University of Pretoria, South Africa. His research interests include human rights, elections, security and criminal justice.